As we enter the unpredictable month of February, and eagerly await the groundhog’s prediction, certainly there is much to do! However, this uncertain and often busy month, as of 1949, received another significant meaning. In the years since this significance has become continuously more predominant and widespread. On February 8th, 1949, the day was designated as “Children’s Dental Health Day” by the American Dental Association. Since then, this small yearly event has expanded from a one-day/week-long event held in both Cleveland, Ohio and Akron, Ohio respectively, to a month-long nationwide program. Later it was officially being dubbed as National Children’s Dental Health Month (NCDHM). This annual health observance brings together hundreds of thousands of dental practitioners, health professionals and providers, and oral health experts and enthusiasts, all for the common goal of promoting and educating children and parents alike on importance of practicing proper oral hygiene. Therefore, in the spirit of this continuously growing month of awareness focused on children’s dental health, we have compiled a list of some useful ideas and tips. We hope they will help you take on the mission of finding the best way to teach your child how to brush and floss properly to care for their teeth. Dr. Charles R. Kimes and his expert team at Overland Park Dentistry offer dental health services for patients of all ages. 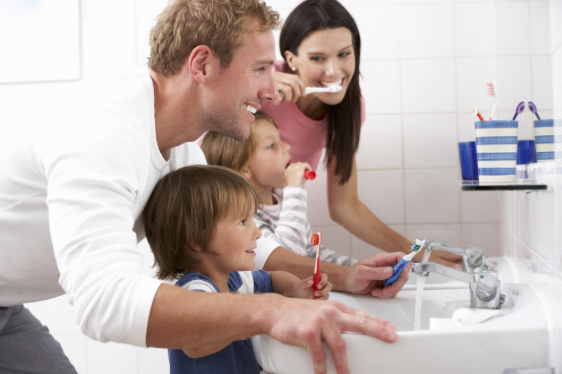 We believe that the foundation of all learning starts at home; and dental health is no different. While teaching a young child the right way to care for their teeth may seem like a daunting task, sometimes a little imagination and a few simple changes can make all the difference and change a chore to a new habit! When it comes to children’s oral health, it’s certainly always a good idea to nurture the habit of practicing proper oral care from an early age. This helps cement the importance of oral hygiene and having healthy teeth. However, when it comes to teaching children why it’s necessary and the process to correctly care for their teeth; things can get tricky fast! As you know, teaching kids is not an exact science; they’re all different with their own interests in learning new things. Even though there are countless theories and beliefs on this concept, finding the right approach for your child can be a difficult chore. However, according to many primary school administrators, young children are often creatures habit, and learn most effectively when taught in repetition or a type of pattern. Obviously, this may require a bit of creativity and some patience, but taking the time to teach your child the basics of oral hygiene is truly a fun and rewarding endeavor! Who’s a better role model to your children than their parents? Yep! That’s You! Let your child watch your brushing routine. Stress the importance of proper technique and show them how you brush your teeth. Also explain to them why you brush … to keep those nasty cavity monsters away and have a shiny white smile! Your children will follow your lead. You never know, once they have mastered caring for their teeth, they may enjoy teaching their younger siblings, since they are so experienced! We understand you may be reluctant to “bribe” your child into having a good oral hygiene routine; sometimes a little added incentive can make a huge difference! It’s the little things, like purchasing new toothpaste in their favorite flavor, or letting them pick out a cool new toothbrush! These things may not seem like a big deal to you, but to children, it can make a world of difference. You can even hang a Brushing Calendar in your kiddo’s bathroom to be filled in each morning and night after they brush! Color it or get fancy with their favorite stickers! Children thrive on routines, so you’ve gotta stick to it! Whether you’re making it a game, incorporating some fun activities or special incentives, consistency is always the key. Always make oral hygiene part of the daily morning and evening routine, because these habits for healthy teeth will last a lifetime. Dental Health Services: Start Now! As National Children’s Dental Health Month swings into full effect, there is perhaps no better time than now to give your children some hands on lessons in oral hygiene and dental health. We hope the information above provides you with some fresh ideas and information, or at least serves as a helpful reminder to make sure your kids are practicing proper oral care. If you have any concerns or would like some additional tips and information please contact our office. Overland Park Dentistry offers dental health services for kids of ALL ages! Offering dental health services for kids is important to us, because we love our patients and we want them to be healthy. If you’d like to schedule an appointment, contact us at our south Overland Park office at (913) 647-8700 or our north Overland Park office at (913) 341-2380. We look forward to having the opportunity to be your Overland Park family dentist.